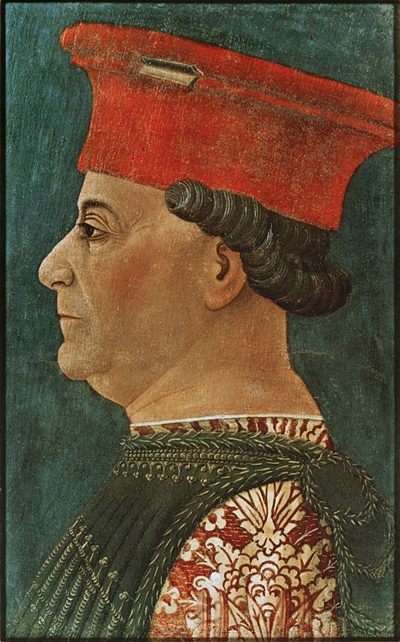 Francesco Sforza, Duke of Milan, who won his principality with difficulty, but held it with ease. Attribution:Bonifacio Bembo [Public domain], via Wikimedia Commons..
Francesco Sforza (1401 - 1466) was a mercenary soldier (what Machiavelli would have called a "condottiero", i.e. a military contractor) and the son of a prominent mercenary whose practice centered on the Duchy of Milan, which included the city-state of Milan, a cluster of dependent cities (including the some-time capital city of Pavia) and the surrounding territory in the northern thigh of Italy. Father and son rented their soldiers to Milan and her powerful neighbors, Venice in the east and Florence in the south. After his father’s death Francesco won such a formidable reputation that in 1441 Filippo Maria Visconti. offered him a full time job as the husband of his daughter Bianca and ruler of her dowry, the Milanese towns of Cremona and Pontremoli. Bianca’s dowry gave Francesco the toe hold he needed to begin his conquest of Milan when Filippo died in 1447. Where Filippo had represented power, the situation after his death degenerated into the opposite of power, chaos. Milan took the opportunity to proclaim itself the Ambrosian Republic (after St. Ambrose). Saintly intentions notwithstanding, the Ambrosian Republic quickly became paralyzed by irreconcilable political factions. Venice attacked some of the dependent cities; others declared themselves independent. Orleans, Aragon, and the Holy Roman Empire all claimed Milan. Chaos in turn gave opportunity to power. The Milan republic offered Francesco a fixed price contract to defend the city. Being short of cash, the consideration was set by barter at, the city of Brescia. Francesco successfully defended Milan from Venice. However, when the city made peace with Venice behind Francesco’s back, he turned his troops about, laid siege to Milan itself. The City surrendered in 1450. While Francesco’s military coup settled domestic matters, he might still have had trouble being recognized as part of the status quo power structure of Italy, had it not been for a bit of good luck and Cosimo de’ Medici. Francesco had the good fortune to take power just before the Turks conquered Constantinople in 1453. This external threat from radical Islam put pressure on the Italian powers more likely to settle their internal differences. Cosimo had for some time been keen for an alliance with Malan and had cultivated a personal relationship with Francesco, which Cosimo cemented with liberal loans from the Medici Bank. In 1454, with these forces in play, the Italian powers signed the Peace of Lodi and formed the Italic League. These agreements recognized Francesco as the legitimate ruler of Milan, established a balance-of-power arrangement, and put in place a coalition of Milan, Florence, and Naples. This coalition was to remain in effect until the death of Cosimo’s grandson, Lorenzo the Magnificent in 1492. Francesco built for his new duchy public works that included a network of canals and a large hospital and for himself a hansom castle. He established a proper renaissance court, signed alliances, and married his daughter to the prince of Naples. Francesco by increments established firm control over the region and its resources. His grip was firm enough and his enemies sufficiently weakened that he was able to leave his territory to his son, Galeazzo. Galeazzo, however, became a dissolute wastrel, devoted himself to seducing women, and was murdered in church by the big brother of one of the women whose affections Galeazzo alienated. The minority of Galezzo’s seven year old son, Gaingaleazzo, created another power vacuum that was quickly filled by Francesco’s fourth son, Ludovico, who succeeded to the regency. Gaingaleazzo's wife, Isabella of Aragon, daughter of Alfonso prince of Naples, resented Ludovico. Ludovico added insult to Isabella’s injury by marring Beatrice of Este. When Alfonso ascended the throne of Naples, he became antagonistic to Milan, seeking a pretext to intervene on behalf of his daughter. Naples was allied with Pope Alexander VI, who begrudged the Sforza its possession of the city of Forlì, situated in the Papal States. Ludovico tried to counteract the Neapolitan threat aiding Charles VIII of France to attack Naples. He allowed Charles in 1495 to move his army through Milan. Unfortunately, by inviting a powerful foreign army onto her soil, a move Machiavelli would later condemn, Ludovico destabilized the region. The Duke of Orleans soon decided to fish in troubled waters by fielding an army to invaded Italy to re-assert its claim on Milan. Ludovico formed an alliance, the Holy League, with Venice, Spain, Pope Alexander VI, and Emperor Maximilian to expel the French. The alliance succeeded, but when in 1498 the Duke of Orleans became King Louis XII he again invaded and this time conquered Milan. In 1508 Ludovico died in Louis’ dungeon in Berry. Francesco won Milan because he was above all else a military leader. While he lived Milan remained a military power. His heirs became vulnerable because they were not military leaders and allowed military preparedness to decline. Milan came to grief through a strategic error. Ludovico invited, what he should have taken pains to prevent, the intrusion of a powerful outsider into his territory. As the citizens of the Ambrosian Republic can testify, mercenary troops can be hazardous to your power.